What is cloning hard drive? Cloning hard drive is the course of copying all content from one hard drive to another with the help of software or hardware. In general, this process is done by copying files directly from one disk to another, then the target disk will hold same content as the original one, thus it can be done for backup purpose, or restoring lost or damaged files. Unlike simple file copying, cloning disk covers copying hidden file or folders, file directory, in-use files, hidden partitions or even all sectors. This task is not as simple as it appears, as some content is typically not available for "copy and paste" operation. Additional requirements such as recovering lost data from target drive instead of the one being cloned. Disk clone may date back to the time before Windows 95 was introduced when computer makers copied data with hardware e.g. disk copying machine. That solution has defects such as the hardware being used couldn't detect structures of HDD and thus the cloning requires the two drives should have same geometries. Some companies would partition and format drives before copying files with copy or archiving tools like tar. This solution is not effective when boot files or boot sectors which are indispensable parts for system booting are required to copy. The problem mentioned above became more obvious when disk copy comes to Windows 95. This operating system becomes larger than its previous versions and needs more time to complete installation. Windows 95 added longer filenames to FAT file system, which was not supported by copy tools. Besides, PC market saw a great growth then and an effective disk copy solution was highly expected. The major reason for hard drive cloning is the minimizing the loss of time, effort and money. Many computer users might have experienced issues such as a large amount of data gets lost due to virus infection, deletion, formatting, etc. Though users care much about their files and take precautions, unexpected situation just happen. Thus for data safety we should learn the skill of backing up data via disk cloning. Some may question it since there are data recovery companies and recovery software that can help users restore data. However, the reality is that data recovery method do not work on all file loss cases and can't guarantee 100% successful recovery for all situations. Cloning hard drive is the task of making a precise copy of content of one disk to another, which has become easy and simple thanks to the availability of various cloning programs and diverse HDDs and external drives with large capacity and affordable price. It's also feasible to copy disk including operating and transfer data though it is not the best solution for system backup or software upgrades. Hard disk copy only makes one copy of content on the drive, differing from the backup feature provided by operating system which is able to keep more than one versions of files and changed data for target drive. The advantage of cloning disk is keeping data on different drives as well as perform data recovery from the target drive in case of damaging data on original disk. Files and data on your drive will become portable as identical content has been cloned to another drive. If you need to use your files in several locations and the desktop is not convenient to take, then you can clone needed data to a removable or external USB drive then carry it to anywhere you go. 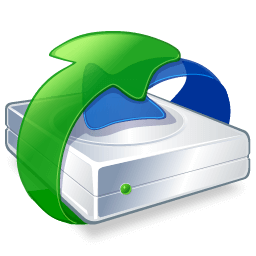 This operation will guarantee all programs are well installed and files stored in same directory and you don't need to make extra settings since you have taken everything with you. As to data recovery, disk image or cloning is often used in the event of hard drive failure which is damaged so badly that file recovery can't be carried out directly from it. Such cloning requires all sectors should be copied which means disk is cloned sector by sector instead of file directory. Thus it needs specially designed tool to complete the task. Computer beginners puzzles when to clone hard drive and when to image a disk, as they fail to tell the differences. Cloning makes the complete copy of original disk, such as folders, partitions, file system, partition table, etc. The target drive will contain the direct duplicated content. When cloning is done content on the drive will look exactly the same as the one installed in your PC. Once you have made the drive contain identical data, you can either use it on other computers or put is in a drive enclosure changing it to portable drive. The new drive should have equal or larger capacity than the one being backed up, which can be an empty hard drive or a portable drive. For instance, if there are only 50GB files stored on a 320GB drive, cloning programs will ask you to clone data to a drive that is no smaller than 320GB. Imaging disk, on the other hand, creates backup of original drive and compresses all imaged data to an image file. The image file is a single file which can be stored to any location that has enough space. Imaging is more used to backup system partition, because it can be restored when system crashes. The image file is created with special algorithm of the tool you use and it can't be opened directly. To access files in image file, you need to restore it to a drive, while you can process files on cloned drive after it is connected to computer. Creating a clone for your hard drive is good way to protect data including operating system, installed programs and personal data. In many cases, the cloning process is not simply copying and pasting data from one drive to another. To meet different demands, specialized software is needed to help finish the task. People clones disk roughly in two manners: file-level cloning and sector-level cloning. Each has its advantages and disadvantages, and not all cloning software supports them. File-level cloning can be further sorted into two types: copy files only and copy files with original file directory and layout. File-level disk cloning copies files and partitions as they are on the drive and some tool copies files without cloning fragments. Thus, you can take advantage of disk cloning to defragment hard drive. Sector-level cloning, on the other hand, copies everything sector by sector after which the new drive will be sector-level identical to the old one. Not only files are copied with layout but also all sectors either free or contain data are copied. Sector-level copy often used to transfer operating system or hard drive recovery software, while file-level is mainly used for backup utilities. File-level disk clone takes much less time if there is little data to be copied. --Users can set operations for computer when clone is done. Since the cloning process usually costs very long time and you can set the computer to shut down automatically when the task is completed. --PartitionGuru supports Windows only but it's able to clone hard drive that comes with files system used under other systems such as HFS, EXT4. To make preparation for cloning your hard disk, you'll need a hard drive to store cloned content. The drive can be an external drive or local disk and should be equal or larger than the source disk. It's suggested to make the drive larger than the source one if possible, as two drives with same capacity written on the disk label and their exact size is not the same when counting sectors. The target disk might be several-sector smaller than source disk and in that case the cloning can't be performed. Cloning process copies data to new drive and overwrites existing files on the drive you prepare, which means files on it will get lost. Thus you should make sure the disk doesn't hold any important data, otherwise backup should be done first. The next preparation is software setup. 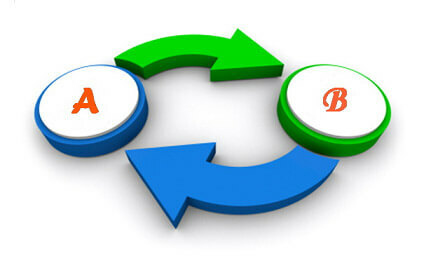 Cloning software will be needed to create the clone to simplify the task and meet other demands. PartitionGuru is a good choice and it offers all popular clone methods and it has a free version for home users. Users can free download and install it to start cloning disk following its clone wizard. Connect the two hard drives to computer and launch PartitionGuru and you can find their detailed information in the program. 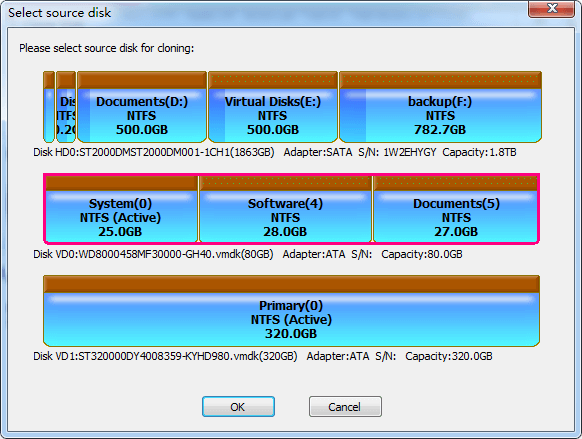 Click "Tools" and select "Clone Disk" and you'll get a pop-up window to choose source and target disks. Select disks for cloning. Note that the source and target disk are correctly selected, otherwise you can't make it clone right or even lose data. First you'll get the "Select source disk" window to select the disk to be cloned. Find and select it and click "OK" button. 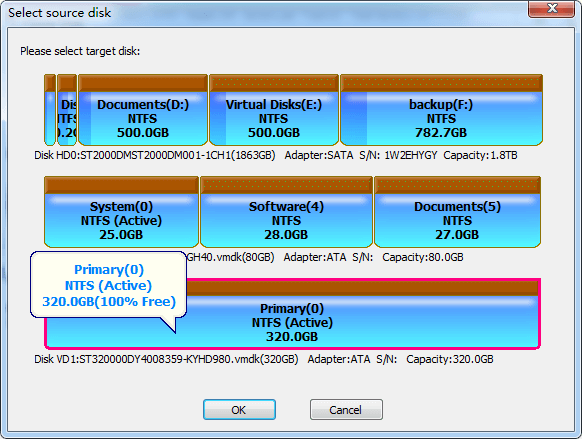 Next is to select target disk to store cloned content and click "OK" button. Choose clone mode and get it started. Here the clone is made in sector-level. Besides, you can set operations for computer after the task is completed, such as power off, reboot.